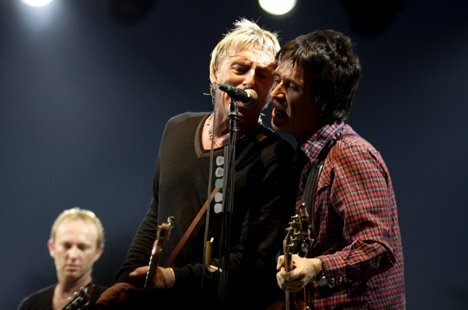 More Paul Weller At Coachella! – Paul Weller News! More Paul Weller At Coachella! 6 Comments on More Paul Weller At Coachella! After roughly a half-hour of top-notch rock ‘n’ soul, culminating in some extra-fine space-jamming on “Porcelain Gods,” Weller was informed that he had a measly 15 minutes left. “Just not long enough in the desert,” he sniffed in between expletives. He had every right to be pissed. There was no reason to quit early: Public Enemy didn’t need an hour to set up, it wouldn’t have harmed My Bloody Valentine any to have Weller carry on, and yet another rumor that No Doubt would turn up for a five-song surprise never came to pass. Let the man play! Imagine how much more fulfilling this set could have been with more morsels served up within another 20 minutes, instead of a flat 50. Not exactly the right way to treat a Coachella forefather. But suffice to say -– and I’m talking to you, Mozheads, after you watched your ’80s idol act the diva Friday night –- this is how an English icon soldiers on when faced with a demeaning concert situation. Like Atmosphere says, when life hands you lemonades, you paint that s*** gold, (bleeper-bleeper)! Had Weller been squeezed onto the main stage, people might have at least taken notice of the old leader of the Jam and the Style Council. Perhaps then he’d have gotten his due around here, maybe via the chanting of “Eton Rifles,” one of the most biting Jam songs, about a different, even refined sort of class struggle than the Third World uprising M.I.A. calls for. Surely casual ears would have recognized “A Town Called Malice,” although probably only as “that song by that guy who did that other song.” They still would have bounced and wiggled along to its deceptive Motown glee. Instead, to cap his Sunday show, the now silver-haired Weller, looking Armani casual cool in a black outfit, was left to kick against the pricks in a chugging rendition of his minor MTV hit with help from … well, how nice, former Smiths guitarist Johnny Marr, who strummed a bit and shared in on the bop-bop-bop-bop harmonies. Wait, what? You didn’t catch that killer moment? Oh well — your loss, our gain. Don’t know the guy that wrote that but I sure do want to buy him a drink, or three. I was very interested to know what happened in Coachella for Paul, knowing he would be put into a land of MTV/Indie college kids. The difference being,somehow Paul missed the “I respect this 80’s era music bard” mentality that the younger folks have for people like Strummer. You can’t blame any one entity for this, the crowds, the promoters, publicists….it is what it is. I think those of us who appreciate Weller music either come from an era where The jam/Style Council meant something to us or we can see a world class songwriter or both. I give props to Paul for hopping off the singer/songwriter train at times and showing he still has angst enough to pull off songs like Echoes round the Sun, From the Floorboards Up etc.Yet still magically pulls off the acoustic sessions that focus more on his songwriting, or at least in a different way. I went to the SF show which got bumped to a smaller venue (which personally was happy about), but as my lady friend and I walked in, her first comment was “it’s all people our age”. It was a great show, but she was right, the crowd was predominant with 40 somethings. Would things have changed in Coachella if Gwen Stefani came up and did a duet? maybe….but would that be something Weller fans want to experience? or a better question, does Stefani know who Weller is? For whatever reason Americans (ie the masses in America) don’t get Weller. I can’t explain it. In Europe he is beloved and plays to sold out shows, here in the U.S.A. it is his old fans that grew up with his music. I was hoping to go to Coachella this year but couldn’t..just to see Weller. Sorry I missed it. Coachella is a strange place, mostly the young set (ie 30’s and younger). This year more acts were “older” ie McCartney, Leonard Cohen etc, but still to be in 100 degree heat …well “older” fans don’t go. Weller always puts !10% into every show, he loves his music and his fans. Not sure why his set was cut short…and no I don’t want Gwen singing with Weller. Noel Gallagher of Oasis yes…he loves Weller like us, his fans. I read this earlier and here was my response. This guy is WAY too sensitive. Paul RULED Coachella! Aren’t you a sour puss huh? Have you ever seen Paul in the US before? How about his last time in LA? Two nights at the Wiltern, a Tuesday and Weds. Both nights, place half full. He was on the 2nd biggest stage there and, given some of the other folks throughout the time who were on there, I would say pretty good. Also, the number of people who were watching him by the end compared to how many were watching 5 minutes before he came on was…. 20 fold? WELL OVER 1000 people? Where were you? Curled in a ball on the ground with a blanket over your head? I saw several other big acts that day and NONE had the press coverage he did. When he first came on, there must have been 30 photographers there RIGHT UP on his face until security cleared them all out half way through. It said on the schedule 50 minutes. Did you just WISH for this one act he would get 90…. or…. why did you think it would be more? I don’t get it. No one else got more than the time alloted? Have you ever been to a concert before much less a festival with 150 acts? Being on time is THE critical element. My Bloody Valentine went on 10 minutes too long and the Cure was a half hour late. That sucked. I thought when he mentioned he had 15 minutes left that he was glad he had more time and thought that he was supposed to be done right then. Also, did you happen to look at the schedule and see who he was playing up against? Some of Pop’s biggest names these days hands down. I thought it was just going to be the 50 of us there before he started and was impressed with the turnout. He was AWESOME as usual and they put on a great show. I think the only one who got robbed was you. i’m biased of course, but this was the absolute, undeniable highlight of the weekend for me. the show was so good, he played with so much energy and musicianship. i have to apologize sincerely to anyone standing near me (front row, center) i was just hysterical the entire show – haa! like, tears and hyperventilating. haaa! i hope i didn’t ruin the gig for anyone, but i’d never seen him live before (after 20+ years of rabid fandom) and my god! eton rifles, johnny marr appearance, changingman… way too much for this old girl to handle. saw PW in the artist’s village prior to show and he was so gracious letting me take a photo. it’s a not-so-good snapshot but i’ll treasure it for years to come. got a couple of snaps during the show. anyway, thanks to our man for playing the festival! 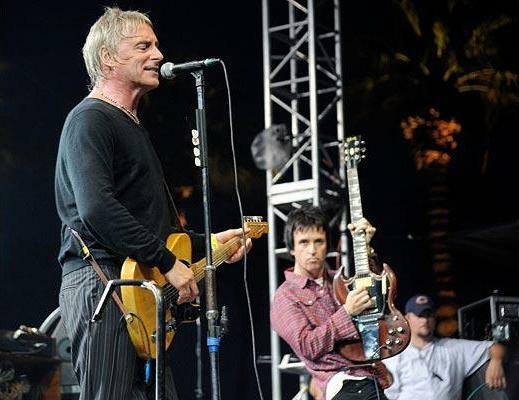 Previous Entry Paul Weller At Coachella!